Hip dysplasia is a debilitating joint condition that affects all dogs but is particularly prevalent in the bigger breeds, with more than 50% of affected dogs being large or giant. The trait is genetic (polygenic) but can also be influenced by environmental factors such as over-feeding a dog during puppyhood or exercising it too excessively. Hip dysplasia occurs when 1) the femoral head (hind leg joint) is not held snugly by the acetabulum (hip socket) and 2) when the acetabulum/femoral head become misshapen and are no longer smooth and round, therefore making it impossible for either to support the other. In a normal joint, fibrous cartilage supports the areas between the bones, making for smooth joint action and fluid movement. In a dysplastic dog, the articular hyaline cartilage, which ordinarily provides cushioning, is eroded away, causing the femoral head to become separated from the hip socket and to rub or place pressure on different parts of the pelvic bone. This causes the hip socket to lose its depth and the femoral head to become flattened or deformed. As bone is worn away, new bone forms at an adjacent angle, causing more severe pain and rubbing. Minor hip dysplasia may show very few symptoms, while severe cases will alter the entire architecture of the joint capsule and cause mechanical destruction. Depending on the severity of the laxity between ball and socket, a dog’s symptoms will vary. The separation of the two bones through muscle, ligament and connective tissue weakness is called a subluxation. 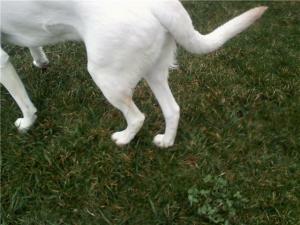 The hind leg is no longer bonded to the pelvis so it moves away, causing crippling pain and lameness. Dogs with inherited hip dysplasia are born with normal, healthy hips that progressively worsen over a 4-12 month period (early-onset hip dysplasia). Arthritic conditions can also trigger hip dysplasia in later life (late-onset hip dysplasia), while environmental factors such as rapid weight gain, obesity, pelvic injuries and nutritional factors can all play a role in its development. Hip dysplasia is one of the most common skeletal disorders affecting dogs, while being a rare condition in cats. How do I know if my dog has hip dysplasia? All dogs can develop the condition although incidences are rarer in small breed dogs. Large and giant breeds are predisposed to it more than others, with a high incidence in Great Danes, St. Bernards, German Shepherds and Golden Retrievers. Symptoms of hip dysplasia are fairly obvious to detect. Exercise intolerance is probably the first indicator that your dog is suffering from joint pain, as well as showing a reluctance to jump, run or climb stairs. Bunny-hopping is a common sign with dogs raising both hind legs at the same time to 'hop' up stairs and during exercise. Rear-end swaying, stiffness, post-exercise lameness, frog-sitting (with one hip splayed out) and obvious signs of pain are all symptoms of hip dysplasia that need further investigation. If your dog walks with his hind legs closer together than his front legs, whether he hops or sways on them or not, he should be assessed by your veterinarian as soon as possible. Untreated hip dysplasia can lead to arthritis and chronic pain, which will affect your dog's quality of life. What are the effects of hip dysplasia? Hip dysplasia is a very painful and distressing condition that affects a dog's ability to move/exercise and find a comfortable position. When the condition becomes advanced, chronic osteoarthritis (or degenerative joint disease) can develop. This affects the bones and soft tissues, causing lameness and debilitating pain. A dog is likely to become immobile and lethargic, losing interest in play and feeding. In its early stages, hip dysplasia causes stretching of the nerve endings and inflammation within the joint capsule, factors which account for the pain. Hip dysplasia can affect both hind legs and may cause spinal distortion as the body compensates for the hip's loss of motion. In some cases, the knee joint may also be affected as the shift of weight changes and the skeletal architecture is altered. The development of hip dysplasia is a vicious cycle; the more the joint becomes damaged, the more susceptible it is further damage. New bone that grows in place of old can degrade the joint even more, which is why early diagnosis is essential for effective treatment. In its advanced stages, hip dysplasia can cause severe symptoms ranging from sudden, unexplained aggression, to muscle waste in the hind quarters and an extreme reluctance to be touched. As already mentioned, some dogs are more susceptible to hip dysplasia than others and preventative measures are not always viable. In larger breeds, ensuring dogs are not over-fed or over-exercised when they are puppies is crucial as this can increase their chances of developing hip dysplasia tenfold. It may also make them develop it a lot quicker than they would have done otherwise. Vigorous, high-impact activities that place pressure on joints (i.e. frisbee, jumping, and lots of running) should be avoided in puppyhood, while gentle walking and jogging will pose no additional risk. Hydrotherapy is a great means of exercise for dysplastic-prone dogs. In terms of nutrition, avoid high calorie, high protein diets, as these cause rapid weight gain and lead to bones developing at a faster rate. When it comes to treating existing cases of hip dysplasia, there are several treatment options. The effectiveness of these very much depends on the degree of the problem before diagnosis. Hip dysplasia in its advanced stages usually requires surgery to correct. The type of surgery your dog needs will depend on its age and the stage of dysplasia progression. Total hip replacement may be necessary in some cases and although this is a major operation, it has a high success rate. Hip reconstruction surgery is also an option for some dogs, as is targeted massage and physical therapy. If surgery is not on the cards, there are other treatment solutions. Anti-inflammatory medications may be prescribed, along with analgesics for pain relief. Nutritional joint supplements containing omega oils, glucosamine and chondroitin have been recognised as effective against canine arthritis, helping to lubricate joints and reduce inflammation. VioVet offers an inclusive range of tried-and-tested joint care supplements, which can be viewed here. As pet owners, we all understand the temptation to spoil and indulge our animals, especially when they appear to be under the weather. Obesity is a growing problem in cats and dogs and is one of the most detrimental factors for dogs suffering with bad joints. If your dog is exercising less because of a joint problem, it will need fewer calories from its diet. There are a range of diets on the market that are geared at helping your dog maintain an ideal weight and keeping off the pounds. To browse our expansive range of dog foods, click here. While hip dysplasia can be very uncomfortable, its clear symptoms and many treatment options make it a less daunting illness than some other health concerns. If your dog is a susceptible breed or is showing early signs of immobility or joint discomfort, take him along to the vet for a check up. As far as prevention goes, keep meals light and avoid over-exercising your dog, especially on a full stomach. Supplements that target joint health are a beneficial addition to a daily diet. One of my dogs has hip dysplasia in both hips, one worse than the other. He was diagnosed at about 2 years of age and was prescribed Metacalm, an anti-inflammatory. I put him on Glucosamine almost immediately, as it works for my arthritic knees. He's a different dog now and can do all things he was unable or unwilling to do before. I only need anti-inflammatories occasionally in the winter. He'll be 10 this September and we won't stop these pills - they're great for him! Our rescue springer Harvey who is 7 1/2 was diagnosed with hip dysplasia back in September last year, he also tweaked his cruciate a couple of months later. He has youmove, and Metacam, plus physio and hydro at approx 10 day intervals and they have seen a massive improvement in his muscle strength and I would thoroughly recommend that treatment. Any medication would need to be prescribed by your vet before we are able to supply it. There are various joint and mobility supplements on the market which are worth giving a try. Yumove is one of the best and is highly recommended by our customers. It is clinically-proven to work in 6 weeks and is formulated to support joint structure and promote mobility, containing pure, veterinary-strength glucosamine and natural chondroitin. If you think your dog might have hip dysplasia, hopefully your vet will be able to prescribe a medication to reduce the inflammation. In the meantime, it might be worth giving Yumove a try. Our dog is a Shar Pei crossed with goodness knows what, as he is a rescue dog from Sheffield. He is 4 and a half years old, and was diagnosed with hip dysplasia at about 9 months. He was put on EaseFlex by our vet, 2 daily to start with, and is now on 1 daily. But I now get them from VioVet as they are a lot cheaper. He also had an operation for a loose knee joint on his left back leg. He runs and jumps as though there was nothing wrong, and will be on EaseFlex for the rest of his life. We have a 10mth young Springer Spaniel diagnosed with hip dysplasia a few weeks back. We have started him on Cortaflex. Quite confused as to best diet, currently on Royal Canin Medium Junior and was going to switch to Orijen Puppy (high content Glucosamine/Chondroitin) as GENERAL advice seems to be high protein meat based and less grain/veg based protein but more SPECIFICALLY you advise against high calorie high protein diets which lead to bones developing at a faster rate. Your advice is greatly appreciated.